The latest report from the International Energy Agency warns that a rise in coal use is fueling a global increase in greenhouse gas emissions. The IEA called out Asia as the source of the majority of coal-fired generation. But while Beijing has garnered attention for attempting to crackdown on urban pollution from coal, China is aggressively exporting coal technology abroad. 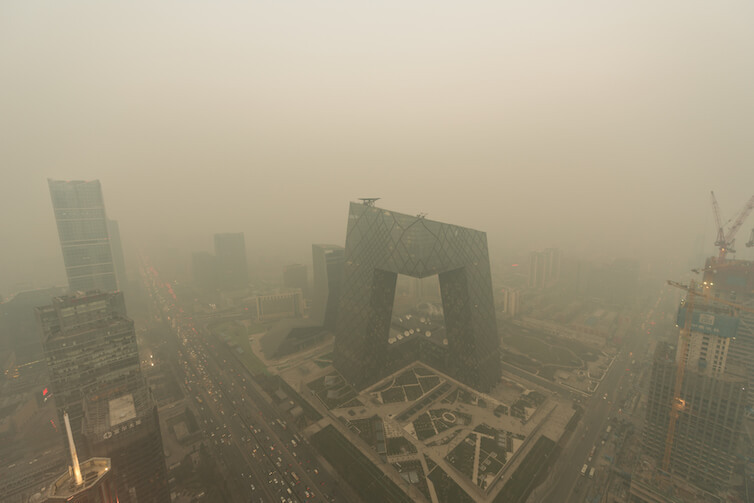 To clean up its smoggy skies, five years ago China launched a US$120 billion war on pollution. It made headlines for reducing coal and steel production, restricted truck transportation and encouraged consumers to switch from coal heating to natural gas or electricity (4.8 million homes switched last year alone). Still, Beijing itself has seen a 35% decline in the concentrations of fine particulates in its skies. If these gains persist, an economist calculated last year in the New York Times, the average Chinese resident can expect to live 2.4 years longer (3.3 years longer in Beijing). Beyond its borders, however, Chinese banks are eagerly financing factories, highways and power stations along the so-called Belt and Road corridors designed to carry Chinese trade and soft power into South Asia and Eastern Europe. In 2018, Chinese institutions provided $36 billion to fund coal plants in 27 countries – accounting for one-fourth of all coal projects under development. In many cases, Chinese money replaced funding from regional development banks scaling back their investment in coal. In 2018, Chinese institutions provided $36 billion to fund coal plants in 27 countries – accounting for one-fourth of all coal projects under development.